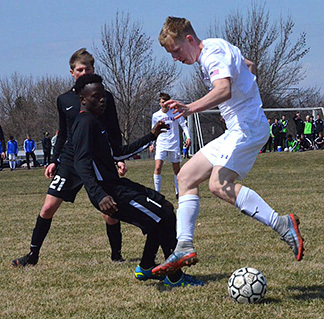 It was a busy start to the 2019 season for the Decorah boys’ soccer team (1-3) as it hit the road for a match Thursday at Dubuque Senior and finished second at the Hudson tournament Saturday. At Hudson Saturday, the Vikings were evenly matched in game one against Waterloo West in a back and forth contest. A dramatic late goal by senior Brayden Krivachek gave the Vikes the 1-0 win. Standing in goal for Decorah for six saves was sophomore Peter Wilson. In game two, Decorah faced off against Webster City, playing well enough and creating chances; however, shots just couldn’t find the back of the net as Webster City claimed the 1-0 victory. Quality play and high intensity showcased the championship match between the Vikings and Hudson. With Hudson leading, 1-0, Decorah put in a gutsy performance at the end of the long day. With approximately 10:00 remaining, a penalty kick was awarded to the Vikings when Gabe Austin was taken down inside the penalty box. Converting on the penalty kick was Willem Hawley to tie the score, 1-1. Ending in a tie in regulation play, tie-breaker rules for the tournament dictated moving directly to penalty kicks. The teams went through six shooters, with Hudson ending up champions after making five penalty kicks, to the Vikings four PKs. Thursday, Decorah opened the season on the road at Dubuque Senior, falling 2-0. After the Rams tallied an early goal, the Vikings rallied with a barrage of offense but couldn’t get the ball in the net. Wilson served 80 minutes in the goal turning away five shots. In the junior varsity action, the Vikings peppered the goal with 18 shots in the 4-1 victory. Junior Dawson Palmer recorded the first goal off a Trysten Finholt corner kick. Freshman Bradyn Hook knocked in the second goal, rounding out first half scoring. Both goals in the second half were scored by freshman Larsson Shockey. Monday, the Vikings were in action at Independence and will host Postville Tuesday, April 9, at 7 p.m. Decorah will pack up and head to West Delaware Friday, April 12, for a 4:30 p.m. game.